The set is dedicated to the memory of Mary Fox of Lisvernane, Aherlow, County Tipperary, who preserved the dance and passed it on to the present day dancers. Originally entered from the notes by Pat Murphy in Apples In Winter. 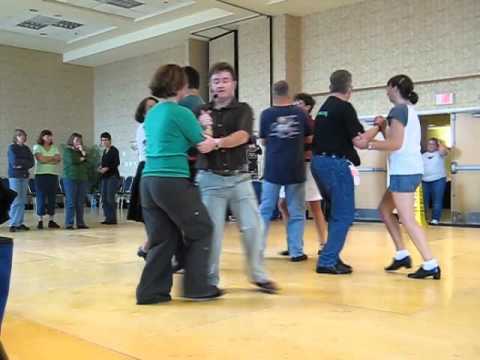 Some groups dance the Aherlow without the tops and sides repeat in figures 1-3. When starting the set with a group you don’t normally dance with, ask if they’ll be dancing the full or short version. Music references - The bar counts and notes from the referenced site do not include the tops and sides repeats in figures 1-3 below. If you dance the Aherlow to the music from Matt Cunningham’s Dance Music Of Ireland Vol 13, the bar counts will match the notes from Pat Murphy and as shown below. In waltz hold, dance two bars in place, then house around the set. Top couples pass through to opposite positions, each lady passing between the opposite couple, turn clockwise at the opposite side and pass back to place. They take right hands (raised) in the centre, turn with left hands around the opposite gent, hands raised again, then chain back to place. 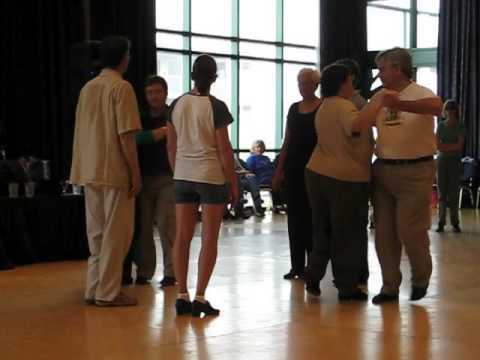 Top couples swing in waltz hold. Taking right hand in right with their partners, top couples advance and retire once, then cross anticlockwise to opposite positions with ladies turning once clockwise under the gent's right hand. Repeat, crossing back to place. Top couples pass through with ladies in the centre and all turn clockwise to face the opposite lady or gent (4b). Moving forward to meet in the centre, all take the opposite persons left hand in left and dance one full turn anticlockwise around them. All should now be facing towards their own places. Still holding the left hands, all dance back to their own side and take their own partner's right hand in right a circle of four. 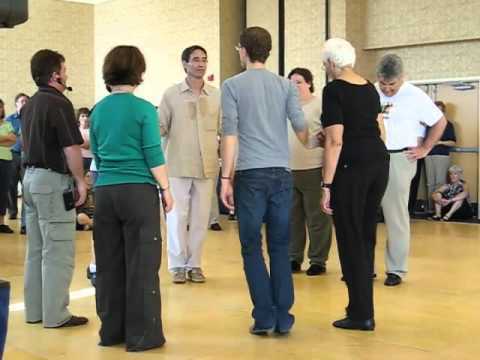 All dance anticlockwise in the circle until they reach opposite positions, where the ladies turn clockwise to face their partners and then all face the opposite couple, letting all hands go. Standing alone, all four dancers advance and retire twice, bowing to the opposite lady or gent the second time. Taking waltz hold, top couples slide to the centre and back, then dance (house) across to their own places. In waltz hold, first top couple slide to the centre (1,2,123) and dance at home from there, turning twice altogether. Second top couple advance across the set holding right hand in right (4b). The second gent takes the first top lady's left hand in left as she turns anticlockwise to stand beside him and all three, the gent and two ladies, retire to second position. The gent is holding each lady's outside hand and the ladies hold each other's inside hands in front of the gent. The line of three advance across again (4b) and the ladies give their inside hands to the top gent. All four now retire to the centre, the ladies turn in to face each other and all form a circle, arms around each other's backs. Swing in four in the centre. Holding right hand in right, all face their own partners. Starting with a hop, all dance 'sevens' to the centre and back twice. In the old céile hold, holding raised right hand in right, palm to palm and also holding their partner's right elbow with their left hands, all couples house around. All advance and retire twice in a circle. All couples swing in waltz hold. With each gent's right arm around his partner's waist and her left hand on his shoulder, all lead slowly to opposite positions. All four ladies advance to the centre, bow and retire (4b), then all four gents advance to the centre, bow and retire (4b). While the gents advance and retire, the ladies move on to the next lady's position on the right. All swing their new partners. Repeat until all swing their own partners again. All couples, in waltz hold, dance two bars in place, then house around the set.